Wauseon’s Noah Tester with good defense on Connor Shirkey of Bryan during Friday night’s Northwest Ohio Athletic League contest. The Indians overcame a halftime deficit for a 40-35 win over the Golden Bears. 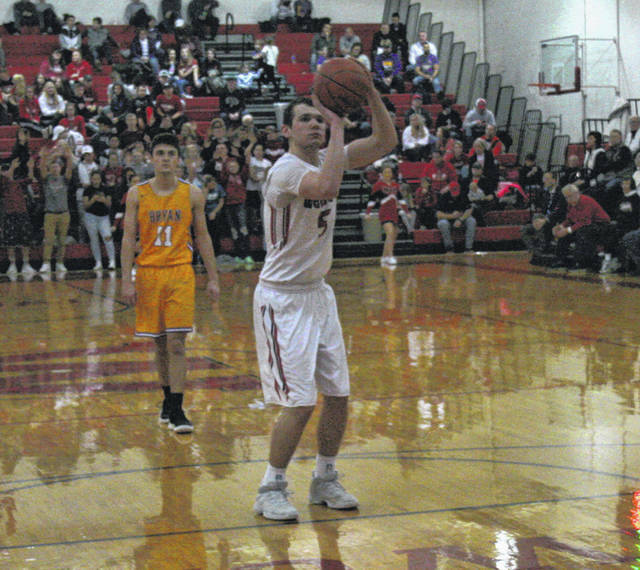 Levi Seiler of Wauseon knocks down a pair of free throws against Bryan on Friday. He led all scorers with 18 points. Trent Armstrong handles the ball for Wauseon against Bryan. 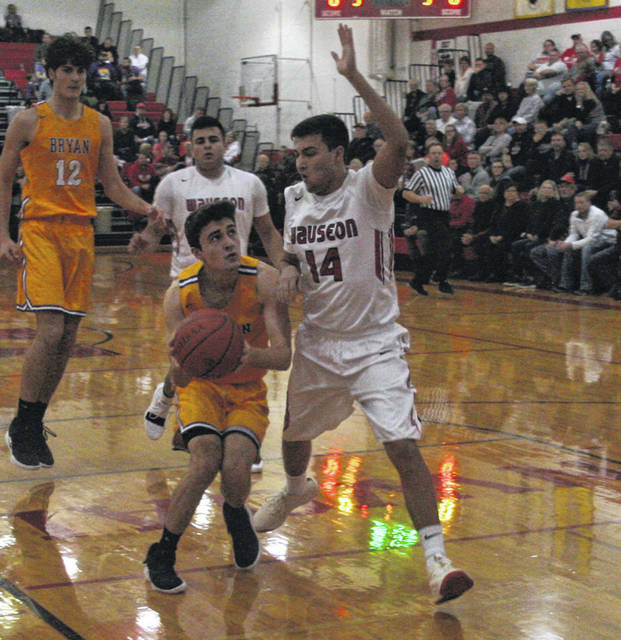 Wauseon made the right halftime adjustments to both Bryan’s 2-3 zone defense, and with their defense in holding the Golden Bears to 10 second half points, fighting back for a 40-35 win in Northwest Ohio Athletic League boys basketball Friday. Wauseon was able to get back in the game with the help of a more patient offensive approach. They got within a bucket near the midway point of the third quarter as a three-point play from Trent Armstrong and a bucket inside by Trevor Rodriguez cut it to 27-25. The Golden Bears answered back with Connor Arthur’s bucket, but seven straight points from Levi Seiler gave Wauseon its first lead since the opening quarter, 32-29, with 7:18 left in regulation. The Indians built their lead to as many as six over the next few minutes before the visiting Bears made one last rally. Two free throws by Arthur and a Zuver jumper cut the Indian lead to 35-33 with 3:20 to go. Just over a minute later the Indians got it to Rodriguez who scored inside, extending the lead. That margin held over the next two minutes when Seiler hit a pair from the charity stripe for a 39-33 lead with 29 seconds left. Bryan would turn it over on the ensuing possession and the Indians held on down the stretch. However, it wasn’t always smooth sailing as the Indians were held to 18 points in the first half. It was in large part due to the zone defense played by the Bears, something they did not utilize while facing the Indians at a holiday tournament at Defiance College in December. “We’ve been seeing a lot of 2-3 zone lately, so that’s something we’re gonna have to get better at. Again, I think second half we did,” explained Burt. Bryan took a 12-7 lead in the first quarter with the help of a Zuver three-pointer. Sean Brock’s triple for the Indians in the final minute made it a two-point difference at the end of one. 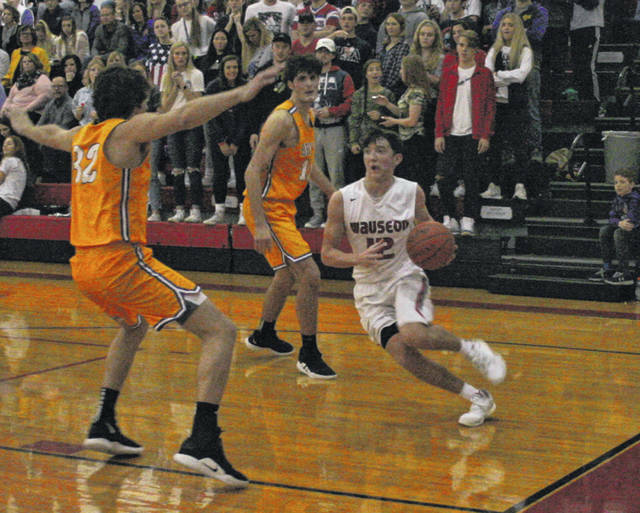 After Brock split a pair from the foul line for the first points of the second quarter, Bryan opened up a seven point lead as Zuver hit back-to-back threes. A Seiler basket got the Indians within 18-15 at the 2:24 mark. Arthur responded with two free throws, then after a Seiler jumper, Bryan’s Reese Jackson scored underneath and Zuver hit again from beyond the arc. The halftime margin was 25-18 following 1 of 2 from the line by Rodriguez, who was fouled as time expired in the half. Seiler led all scorers with 18 points. Zuver had 14 and Arthur 10 to lead the Bears. Wauseon’s non-league game with Pettisville from Saturday was cancelled due to the weather and instead will take place today. They improved to 9-3 overall and 1-1 in the league after the win over Bryan.